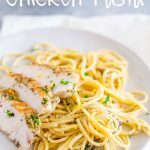 This Lemon Pepper Chicken Pasta makes a great, easy and inexpensive meal for the family; just perfect for weeknight dinners. 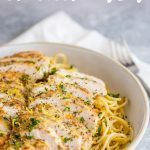 The juicy crispy lemon pepper chicken is served on a bed of lemon pasta, with enough pepper to make it interesting but mild enough for kids. It is quick to make, delicious to eat and is sure to be a hit! Plus if served with a side salad or some roasted veg, then one chicken breast will be enough to serve a family of 4! 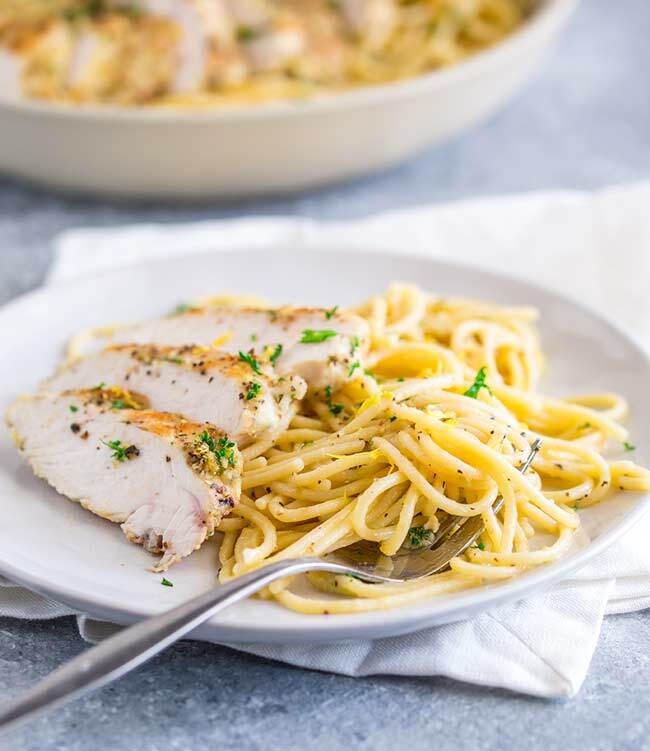 This pasta dish is great if you are trying to avoid heavy cream, gettings it rich almost creamy flavor from olive oil, parmesan, lemon juice, and some pasta cooking water. Yes, the pasta cooking water is the key to almost all great pasta sauces. As the pasta cooks, it releases some starch into the water, meaning that pasta cooking water will naturally thicken sauces and really help them cling to the pasta. You’ll notice that most of my pasta dishes say to remove a couple of cups of the pasta water before draining the pasta. Often you only need a 1/4 cup, but better to have removed too much than to have poured the valuable water down the drain. Whilst the pasta is cooking, the sauce ingredients are mixed together in a bowl or measuring cup. Once the pasta is ready, some pasta cooking water is added and then the sauce is tossed through the hot pasta. This coats everything with a deliciously zesty yet creamy sauce. All ready for the crispy lemon pepper chicken breasts. Although if you are serving four adults you may want to do double the amount of chicken. Also if you find you can only buy very small chicken breasts then you might want to use two. You can see the size of my chicken breast in the picture below. That was enough for the four of us, with the pasta and some roasted broccoli. 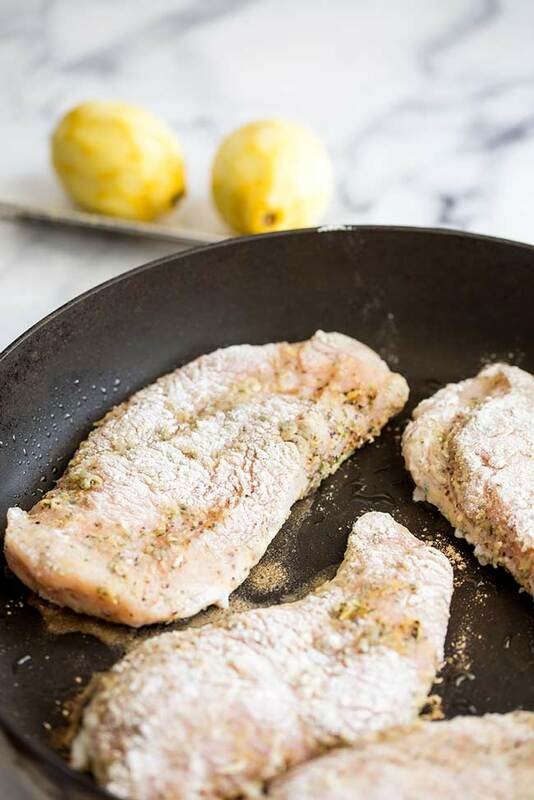 To make the most of the chicken breast and also ensure it cooks quickly, the breast is cut in half horizontally to make two chicken fillets. 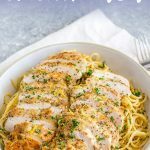 You can read more about filleting chicken breasts in this post for my Honey Pecan Chicken Breasts. How to get enough lemon flavor into the chicken without making it taste sour. The key here is lemon zest! It adds lemon flavor without the sourness you get from lemon juice. Plus it doesn’t dry out the chicken breast like lemon juice can do. These are all mixed together and then used to coat the chicken. Once they have been rubbed into the chicken, it is coated in seasoned flour and fried in olive oil until crispy. 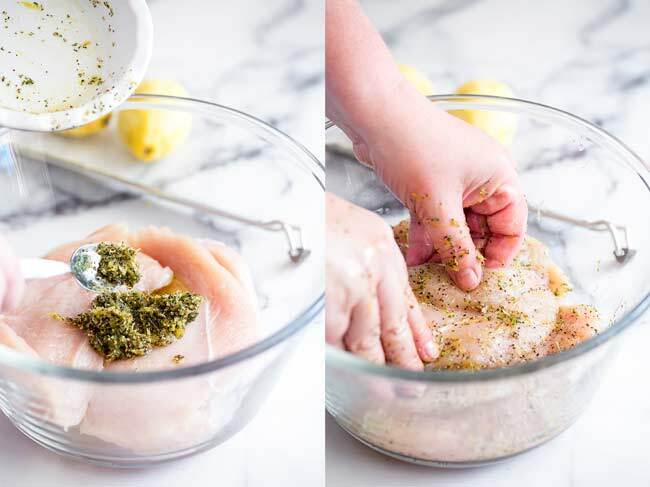 The pictures below are for a double serving of this lemon pepper chicken – hence the fact there are 4 fillets. You can change the serving size for any of my recipes by using the serving size box in the recipe card. Change the number in the servings box and the ingredient amounts will automatically change. You can scale a recipe up or down, just bear in mind that some values might look a little strange when you change the servings. We like to serve this with a side of vegetables, often roasted or sauteed. 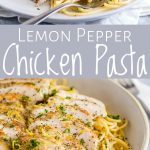 What wine to drink with lemon pepper pasta? Lemon is notoriously difficult to pair with wine, as it softens wines and can sometimes make them taste sweet. I have found this dish can take a really fresh young bubbly wine, like an English sparkling wine or something from South Australia. Or add creaminess with a Chardonnay. But I think my favorite pairing is actually a light sharp red like a Valpolicella. It is mellowed by the lemon and works well with the pepper. 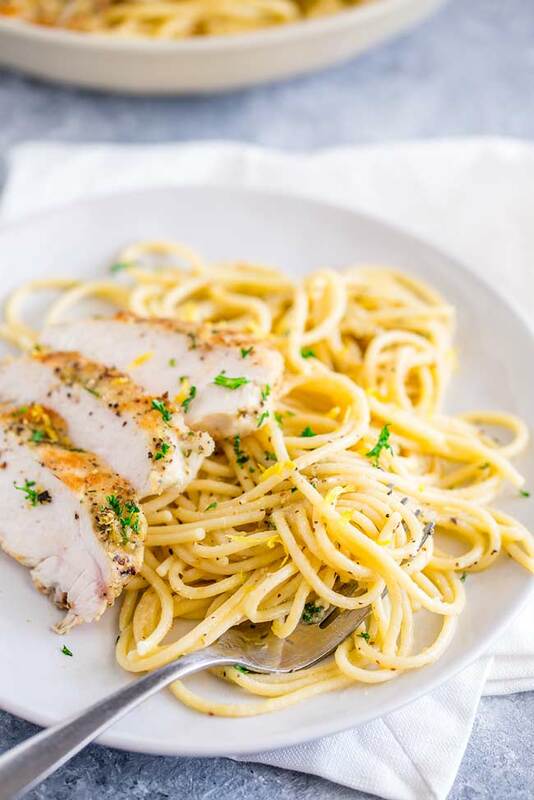 Pin this recipe for Lemon Pepper Chicken Pasta. Pin it here. 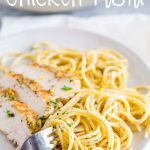 This Lemon Pepper Chicken Pasta makes a great, easy, inexpensive meal for the family; just perfect for weeknight dinners. 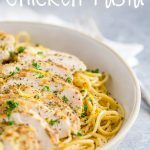 The juicy crispy lemon pepper chicken is served on a bed of lemon pasta, with enough pepper to make it interesting but mild enough for kids. It is quick to make, delicious to eat and is sure to be a hit! Plus if served with a side salad or some roasted veg, then one chicken breast will be enough to serve a family of 4! Start by zesting and juicing the lemons. Mix the lemon juice, olive oil, parmesan, salt, and black pepper together in a measuring cup. Add in half of the lemon zest. Set the sauce to one side. 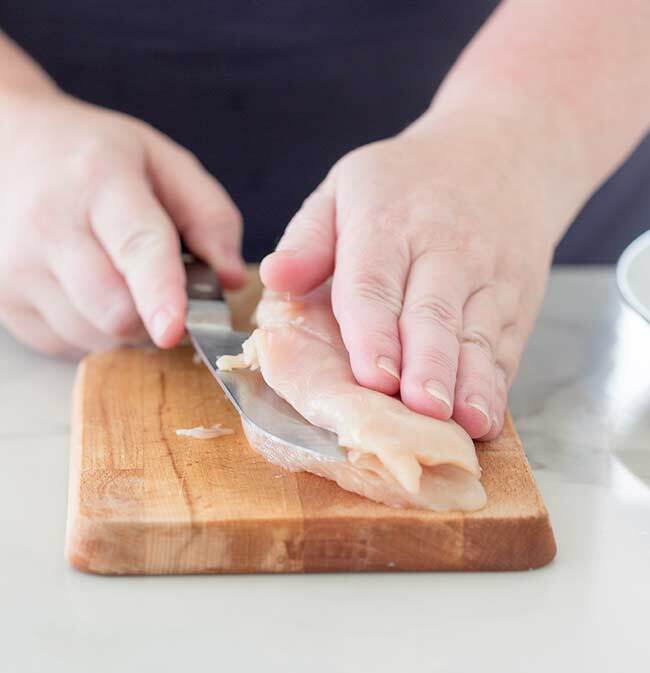 Lay your chicken breast flat on the board and use a large sharp knife to cut sideways through the breast. Continue to cut through the chicken breast, keeping the knife flat and parallel to the chopping board until you have two plump fillets. Add the remaining lemon zest to a small bowl, then add the olive oil, black pepper, dried parsley and mix together well. Pour this lemon pepper mixture over the chicken fillets and massage until well covered. Combine the flour and salt in a shallow bowl. Take each chicken fillet and lightly coat it in the flour. Place a large skillet/fry pan over medium heat, add the oil and let it heat up whilst you get the pasta on. Bring a big pan of water to a boil, salt it generously and then add the pasta, set a timer for a minute less than the packet suggests. 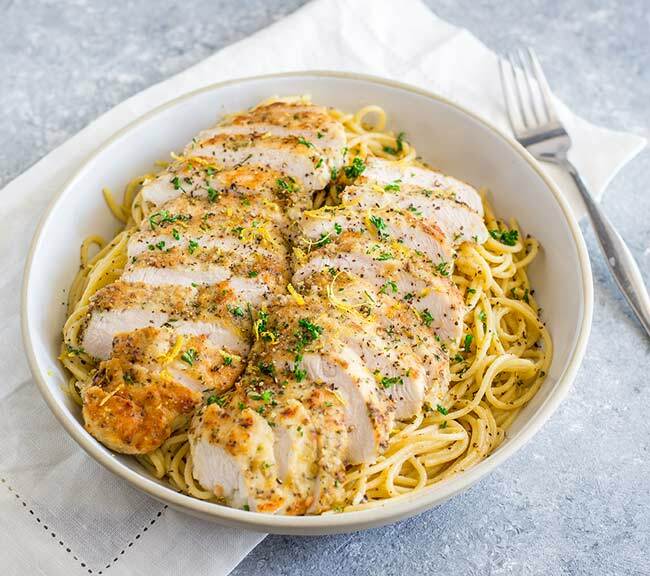 Once the pasta is boiling, cook the chicken for 2-3 minutes on each side or until the internal temperature reaches 165ºF/73ºC. Once cooked remove the chicken from the pan and slice into thin strips. When the pasta is cooked remove 2 cups of the pasta cooking water and then drain. Add a 1/4 cup of the cooking water to the prepared sauce, stir well and then pour over the pasta. Stir well and add more cooking water until you have a smooth light sauce coating the pasta. 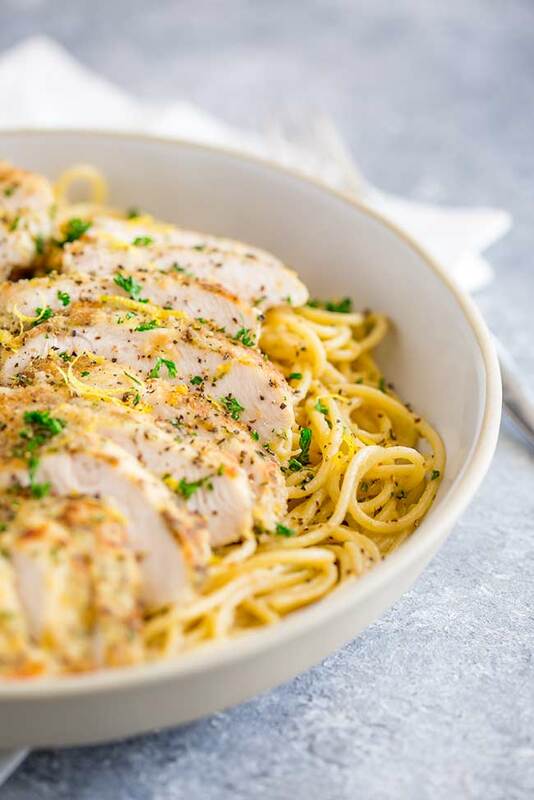 Serve immediately with the sliced chicken and an extra garnish of parsley, pepper and lemon zest. Try to use freshly cracked black pepper from a pepper mill or the course cracked pepper you can buy in the grocery store. If you can only find the fine powdered pepper then reduce the pepper by at least half. Woooww, I can’t wait to try it, Thanks for sharing…. 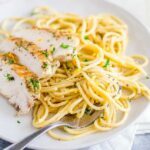 It is a really delicious chicken pasta recipe! And the kids love it!